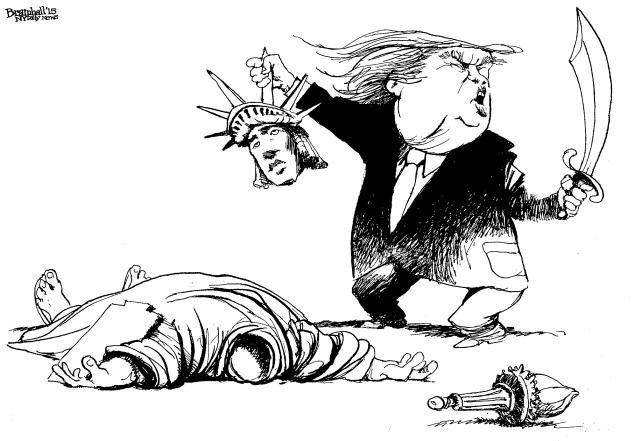 On Monday, December 7, 2015, Bill Bramhall, editorial cartoonist for the New York Daily News published the following image of presidential candidate Donald J. Trump, in response to Trump’s announced policy of denying Muslim immigration to the U.S. The image shows the Statue of Liberty as a victim of Trump’s political terrorism. Lady Liberty, the beloved symbol of American values and immigration, is beheaded. A bloated Trump raises his weapon of choice, a scimitar, historically associated with Eastern and Ottoman cultures. In effect, Trump balances his own scales of justice with her head in his other hand. The remainder of her majestic body lies prostrate, her torch has tumbled away — her welcoming beacon of light is extinguished. Though not a cover, (many of Nast’s cartoons were featured as covers), this cartoon received an equally coveted double-page spread in the center of Harper’s Weekly, the premier illustrated weekly of its era. A portly Tweed, whom Nast dresses as a Roman emperor, sits in his imperial reviewing box and gloats upon his weapon of choice, the Tammany Tiger as it takes down Columbia, Nast’s preferred personification of American values. Drawn 15 years before the Statue of Liberty was dedicated in 1886, Nast favored Columbia as the maternal symbol to represent the American nation. Her cousins, Lady Liberty and Lady Justice, distinguished by a crested helmet and the scales of justice respectively, appeared less often as substitutions for Columbia, but frequently as sisterly companions. 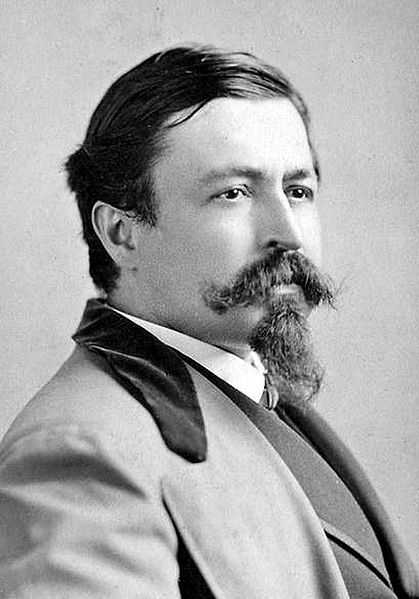 Thomas Nast, known as the “Father of American Caricature” or alternately as the “Father of the American Political Cartoon” rose to worldwide attention and wielded significant political power by the deft and powerful strokes of his pen — the ire in Nast’s ink often appeared on the cover of the illustrated weekly magazine, Harper’s Weekly. To get his message across, Nast and other great cartoonists of the time employed the ego-cutting tools of caricature: ridicule, physical exaggeration, and careful placement of symbols, to elicit emotions from readers and viewers. Nast is best known for excoriating and bringing down New York politician William M. “Boss” Tweed through these techniques. The visibility and power of Nast images continued for two decades as undeniably effective weapons against corruption. According to Nast’s biographer Alfred Bigelow Paine, Tweed representatives tried to entice Nast with bribes to tempt the artist to stop maligning the city boss. Intrigued, Nast strung the agent along, seeing how high he could negotiate the bribe. It reached $500,000, a tremendous amount of money for its time. Nast refused to be bought. 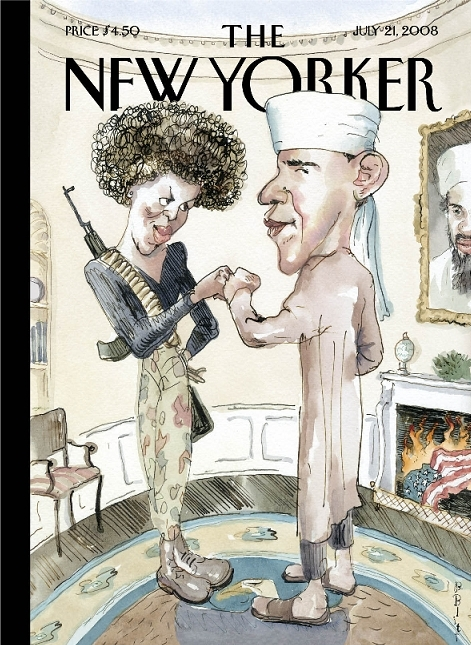 This The New Yorker cover from 2008 elicited a great deal of conversation and controversy. The American editorial or political cartoon in the twenty-first century grasps an uncertain future. The genre thrived in Nast’s era, a time in which photographs could not easily be mass reproduced for the print media. In the century that followed, modern political cartoons traditionally found their stage off the front page, yet, placed in a venerated position in the editorial sections of daily and weekly newspapers. The photograph took over on covers. There were exceptions, of course, the New Yorker magazine being the most notable, today giving prominence to the cartoon cover with provoking results. The tradition of home delivery or buying a paper at a newsstand and enjoying that publication at the kitchen table or office desk— physically leafing the pages and sharing sections among family and friends, assured these editorial cartoons would be seen multiple times over. With the demise of many print editions of newspapers and magazines, new generations of readers are now able to cherry-pick their news from online offerings. Some fans of the art form fear that these hand-drawn visual commentaries, and appreciation for what Donald Dewey has called The Art of Ill Will, might lose their historic influence, or get lost among the many clickable headlines, losing ground to the altered digital photograph — satire by Photoshop. Bramhall’s cartoon offers hope that the cartoon caricature is still beloved. It possesses the qualities to pack a powerful punch. Bramhall’s image rose above the fray and was instantly picked up across media outlets and shared prolifically on social media. 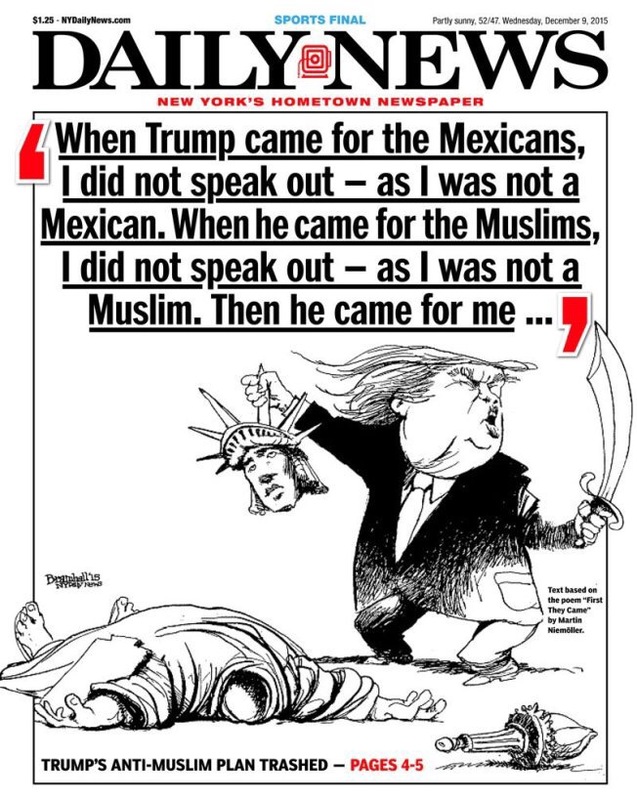 The New York Daily News use of Bramhall’s cartoon as its cover, therefore, is in the best tradition of an excellent and scathingly successful takedown of a public figure by an editorial or political cartoon, drawn and delivered, much like Trump’s sword, as a blunt courier of raw truth. In the best New York City media tradition, the cartoon exposes both the disturbing and the ridiculous. In our saturated and specialized markets, editorial cartoons must compete for broad attention. But when they are timely and deftly drawn, these black and white lines of editorial expression expose stark realities through exaggeration. Ah! To dish out the glorious tool of ridicule, a technique Trump wields with expertise and lately, to great effect. Like Nast and Bramhall’s cartoons, the crème de la crème of caricature will always rise to the top — viral-worthy, these images and the artists who create them, serve the public good by striking a tender national nerve and provoking us to consider both the obvious and the subtle. If Nast were around today, he’d be proud, and perhaps, a little envious. The concern of Roman Catholic interference in public education is brilliantly rendered in what many scholars regard as Nast’s most famous, and well-executed anti-Catholic image. The image was published twice in Harper’s Weekly. The first, on September 30, 1871, implicated Tweed, and reprised on May 8, 1975, with Tweed removed. The image is a tour de force of imagination and caricature technique. Nast dehumanized the Catholic bishops by turning them into reptiles. They emerge from the water toward New York’s shore. Two clergies in the foreground have stereotype Irish faces. Slithering out of the water on all fours, their ornate, jewel-encrusted bishops’ mitres (there are three types, one plain and two that are more elaborate), specifically the pretiosa, worn on Sundays or feast days, are drawn as salivating crocodile jaws ready to devour, or feast if you will, on school children. A Protestant minister or teacher, with his Bible, tucked in his waistcoat, and his saucer hat tossed to the ground, stands defiant, guarding several fearful children who are shivering, praying and cowering as certain death approaches. In the middle of the scene, several bishops have come ashore, ready to clamp down on defenseless, and dispensable non-Catholic students. A Chinese boy on his hands and knees attempts to flee and Native American and African American children press up against the cliff with nowhere to escape. Nast shared a Republican, utopian vision that public schools should be open to all children, regardless of race, creed or ethnicity, and he drew many images of an idealized public school system that included a diverse student body learning in harmony. With the Catholic initiative to create their own schools with the support of public funds expressly underway with support from Tweed, Nast feared separate sectarian schools for all ethnic and racial groups. “Nast believed that bringing children together into the public sphere, under democratic control, muted their religious and racial differences and molded a unified, multiethnic [sic]American society” (Justice 174). Tweed and the Roman Catholic Church interfered with that vision. Perched atop the cliff, Tweed and members of his political machine lower Protestant children to the feeding grounds below. Columbia, Nast’s ever- faithful symbol of American compassion and justice, is bound and led away to a hangman’s gallows. In Harper’s Weekly, the image was accompanied by an essay written by Eugene Lawrence, a nativist and frequent contributor to the periodical. Lawrence blamed the Catholics for the end of the public school system and the Catholic aim “to destroy our free schools, and perhaps our free institutions has been for many years the constant aim of the extreme section of the Romish Church.” The essay continues its attack on Jesuits and the daring aggressive spirit of the ultramontane Irish Catholics who govern New York. The author also touts brave European governments who have dared to challenge Roman Catholic influence of their schools and other institutions. The institutions that managed New York Public Schools claimed their schools provided non-sectarian education. Catholics disagreed, noting Protestant-based libraries, textbooks and “the daily reading of the Protestant version of the Bible” in classrooms as an unsatisfactory environment for learning (Heuston 54). “The establishment of a new state school systems in the United states seemed to substantiate Catholic fears that the attitudes of European secularists were taking root in America” (Heuston 169). Prior to the Civil War, Catholics wanted to participate in the public school system without endangering their faith. Catholics were encouraged to pursue the issue after New York Whig Governor William Seward suggested in 1840 that state aid might be given to Catholic schools (53). Henceforth, New York’s Catholic Church, led by Archbishop John Hughes, began strategies to thwart the new school system by working through their political contacts, but these attempts were unsuccessful. A preoccupation with the Civil War and its aftermath diverted attention from the issue of public education and the topic would not surface again until the close of the 1860s. Catholics once again picked on the issue and “Republican Party and Catholic Church leaders in the late 1860s and early 1870s joined a bitter battle of words over the future of public education” (Justice 171). Justice suggests the American Public School became a metaphor for the northern lifestyle; “the public school evoked the small-town Protestant backbone of the Republican Party” (180). In 1869, Tweed as head of Tammany Hall and acting State Senator, “snuck a provision in the annual tax levy bill for the city through the state legislature” that provided 20 percent of the city’s excise tax be earmarked to Catholic schools (Justice 182). Tweed’s crafty maneuver set Republicans to outrage in motion and solidified scrutiny by the Republican-based press, such as The New York Times and by Harper’s. Nast’s crusade against Catholic interference in the public school system coincided with his attacks on Tweed’s other political malfeasances. His attacks on Tweed tripled Harper’s Weekly circulation (Hess 100). Nast’s principal opposition to the Catholic Church rested on what he feared was its aim to subvert the nation’s public school system by diverting public funds to sectarian schools (St. Hill, 70). Benjamin Justice’s research on Nast’s feelings about Catholic interference in the public school system provides valuable insights. Justice feels that American antagonism toward Catholics resulted from its rapid rise due to immigration and the American Catholic Church’s adoption of conservative ultramontane Romanish leadership, which “increasingly insisted on separate, publicly-funded schools, made it incompatible with republican government and unfit to offer mass education at public expense” (175). Justice surmises Nast’s vicious blasts at the public school issue were a part of a broader attack on the relationship between Tammany Hall and the Catholic Church and were pointed objections to “Catholic political ascendency over the state” rather than an attack on Catholic culture or Catholics as individuals (183). The image is often used as evidence by Catholics to prove Nast hated Catholics. He did not. After all, it was the faith of his family. Nast produced many similar images, but all of his Catholic cartoons hover over two issues – The New York Catholic Church’s demand for public funds to create their own sectarian schools (which they got thanks to their alliance with Tweed) and the conservative Catholic (ultramontane) concept or doctrine of papal infallibility, wholly adopted by the New York Catholics. Blind allegiance to an infallible monarch figure perplexed Protestants Republicans. They viewed American Catholics allegiance to the religious figurehead across the ocean as un-American. As Heuston and others have made clear, the Irish-Americans’ devotion to a pope was clear evidence that American Catholics had no desire to assimilate into American culture and behave as independently-thinking individuals. Most Protestants misunderstood papal infallibility to mean that the pope could not sin. [See Catholic definition] Nast, whose family and religious culture in Germany had aligned with reformed Catholicism, could not fathom that any Roman pontiff could see to be beyond human error. Nast believed what other Republicans and Protestants believed of papal infallibility – that the pope could do no wrong, not make mistakes, and whose word or orders must be carried out by the Irish-Catholic flock. For Nast and most Republicans, it was a doctrine and philosophy with the potential for extreme abuse. Nast’s campaign against Catholic interference in public schools equaled if not rivaled his obsession with Tweed. Nast saw Tweed and the American Catholic Church in New York as symbiotic and co-dependent. This particularly rankled Nast. Nast remains controversial today. His most recent nomination for induction into New Jersey’s Hall of Fame (Nast lived the majority of his time in Morristown) was doomed after a flurry of outrage and has been tabled for another year. With our politically correct fixations, he may never get in. I first learned about Nast when I began exploring my family’s genealogy on sites like Ancestry.com. My lineage is 75 percent potato famine Irish, 25 percent Bavarian German. Raised in the Roman Catholic faith, if asked, my family identified ourselves as Irish-Catholic, but it was never a zealous, over-the-top kind of thing. I grew up thinking we were just “American” like everyone else. A sense of ancestral family history was never conveyed in our home. I was unaware of the experiences of my immigrant ancestors. After seeing the 2002 film Gangs of New York, directed by Martin Scorsese, and watching an interview about the making of the film on Charlie Rose, I learned about a book titled Low Life: Lures and Snares of Old New York by Luc Sante (1992) and I decided to get a copy. It was a fascinating account of the American immigrant experience during the Gilded Age of New York City. It was through this reading that I first learned about Thomas Nast. I was surprised to discover that the Irish were looked upon as low life and wrote about it in an early blog. For my first graduate course, American Art and Culture in Context, each student was assigned to select an artist to represent each century of American history and determine the cultural context in which it was created and why it was significant. I decided to narrow my focus to a particular genre, political/editorial cartoons, and selected Benjamin Franklin as an artist for the eighteenth, Thomas Nast for the nineteenth, and Patrick Oliphant for the twentieth century. Cartooning has always held a fascination for me. As a teenager, I was an amateur pen and ink artist. I fancied myself as a cartoonist and envisioned my career landing in newsprint. I had every intention of selecting art as my major in college and formally honing my skills and artistic voice – but when I found out that all the art classes began at 8 a.m. in the morning, I decided to switch my major to English. True story. Such is the wisdom of a 17-year old that puts sleeping in late at the top of her priorities! Nevertheless, for me, an appreciation for art, and a particular enthusiasm for the oeuvre of Thomas Nast endures. It coincides well with my curiosity about nineteenth century American history, family heritage, politics in general, and how art influences culture and vice versa. Thomas Nast is misunderstood. Given my heritage, I claim every right to put Nast on a $hit list, but I have chosen not to do so. I am not pleased to see my ancestors depicted as apes. I want to know where this comes from and why the stereotype, which originated in Great Britain, migrated to the United States and continued to thrive here for generations. I want to understand what made him draw images like this. Nast did not invent this stereotype, but he certainly perpetuated it. The image at right, The Usual Irish Way of Doing Things has made many appearances on the Web as an example of his vile Irish defamation. It is not a flattering portrait. The image is usually cropped to remove the story below, nor is it considered in the context of events that caused Nast to create the image. To fully understand the image, we need to understand the back story (which I will elaborate on in a future post). One of the benefits of being trained as a journalist (aided by my position as a middle child) is to make oneself aware of all points of view, and present facts in context. It’s easy to stand on a soap box or slip behind a screen and keyboard and rant and rave about policies and positions – an advocate who is right and who is wrong. It would have been very easy to emotionally react to these images and be offended by what at first glance appears as cruel, salacious and mean spirited drawings spewed from Nast’s pen, brush, and pencil. Those were “my people” he maligned. Few would blame me for jumping on the “outrage” bandwagon. I did not react with anger or outrage. Instead, I’ve chosen to ask “why?” Was Thomas Nast a racist? A hater? And if so, how does that happen to someone? Bigotry doesn’t occur in a vacuum. It is learned. How did his time, place and circumstance shape his views? Why does he appear to turn against the faith he was born into and raised for a time? Perhaps my minority Bavarian DNA has something to do with an internal need to find balance and explanation. I wanted to get as many sides of the Thomas Nast story as I could. As these pages and blog posts unfold, I will share the images in historical context, supported by academic research and established differences of opinion, including my own. Fair assessments based on facts. Those afternoon courses in good old fashioned journalism did not go to waste! You are welcome to draw your own conclusions, and by all means, share them. Therefore, it is the purpose of this site to define who Thomas Nast was, what his politics were, his general philosophies and determine what exactly was his beef with the Irish and the Catholics? How did he treat other minority or immigrant groups? Scholars and students of Thomas Nast will generally agree he was a product of his time, he adopted and practiced a new form of Republicanism that was hard won by Abraham Lincoln, which advocated toleration for all races and creeds. When Nast called out the Irish or the Catholics, he did so to protest specific behaviors or practices that he felt were an abuse of power or ran hypocritical of American democratic ideals. In Nast’s world, Irish and Catholics are inexorably intertwined with William Meager Tweed, the Tammany Hall Sachem or “Boss” that ran a corrupt “Ring” in New York City. Tweed was a Scots-Irish Presbyterian, and as a younger man was no admirer of Irish Catholics. All of that changed when Tweed quickly figured out the political value of this massive immigrant population. He cultivated the allegiance of the Irish and the Roman Catholic Church for expedient political reasons. In the view of many at the time, especially for the Republican, Protestant ruling elite, Tweed’s arrangement was a malodorous quid pro quo – votes for favors. That the Irish allowed themselves to be so manipulated by Tweed and how a particular church grew and benefited directly as a result of Tweed’s support with public funds is at the heart of Nast’s ink and ire. 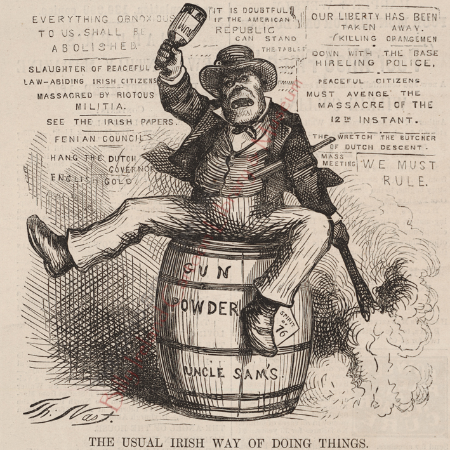 Thomas Nast did not have a fundamental problem with the Irish or with Catholics. His family faith was Catholic! Nast was consistent in calling out corruption and hypocrisy wherever he saw it emerge. Had it not been for their political alliances, which in Nast’s view involved stolen elections and misappropriated public funds, there would be little reasons for Nast to attack the Irish Catholics. His pen would turn on anyone, or any group, who he felt had turned on his or her principles or moral code. I will examine Nast’s use of symbols and stereotypes and seek to explain, rather than excuse their employment in his work and commentary. Everything Nast drew, was executed with deep conviction. One may not agree with Nast’s conclusions, but those who are informed of his life and times find it difficult to question the well of integrity and consistency from with which Thomas Nast drew his creative inspiration.